The tag 'Mark Zuckerberg' is associated with 2 posts. 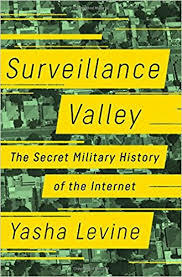 Yasha Levine’s recent book “Surveillance Valley” is a MUST READ! Relatively short and very much to the point, this volume–subtitled “The Secret Military History of the Internet”–chronicles the fact that the Internet is a weapon, developed as part of the same group of overlapping DARPA/Pentagon projects as Agent Orange. In posts and programs to come, we will more fully develop the basic themes set forth in the excerpt recapped in this post: 1 )The Internet is a weapon, developed for counter-insurgency purposes. 2) Big Tech firms network with the very intelligence services they publicly decry. 3) Big Tech firms that data mine their customers on a nearly unimaginable scale do so as a direct, operational extension of the very surveillance function upon which the Internet is predicated. 4) The technologies touted by the so-called “Privacy Activists” such as Edward Snowden and Jacob Applebaum were developed by the very intelligence services they are supposed to deflect. 5) The technologies touted by the so-called “Privacy Activists” such as Edward Snowden and Jacob Applebaum–such as the Tor Internet function and the Signal mobile phone app– are readily accessible to the very intelligence services they are supposed to deflect. 6) The organizations that promote the alleged virtues of Snowden, Applebaum, Tor, Signal et al are linked to the very intelligence services they would have us believe they oppose. 7) Big Tech firms embrace “Internet Freedom” as a distraction from their own willful and all-embracing data mining and their ongoing conscious collaboration with the very intelligence services they publicly decry. Let the Great Unfriending Commence! Specifically, the mass unfriending of Facebook, which would be a well deserved unfriending after the scandalous revelations in a recent series of articles centered around the claims of Christopher Wylie, a Cambridge Analytica whistle-blower who helped found the firm and worked there until late 2014 until he and others grew increasingly uncomfortable with the far right goals and questionable actions of the firm. And those questionable actions by Cambridge involve a larger and more scandalous Facebook policy brought forth by a Facbook whistle-blower, Sandy Parakilas: Facebook was handing out exactly the kind of data collected by Cambridge Analytica to all sorts of app developers for years. Beyond that, it appears that Facebook really did have an exceptionally close relationship with Cambridge Analytica’s research partner and was only bothered by its data collection when the media got wind of it. It also looks like Steve Bannon was overseeing this entire process, although he claims to know nothing. Oh, and Palantir appears to have had an informal relationship with Cambridge Analytica this whole time. And this state of affairs is an extension of how the internet has been used from its very conception a half century ago. And that’s all part of why the Great Unfriending of Facebook really is long overdue, along with a lot of other reforms.